As experts in processes of esterification and transesterification PALMVIT services guarantee maximum efficiency in the extraction of biodiesel from vegetable oils. Thanks to cutting-edge technology of molecular distillation combined with the qualification of our teams, industrial designs PALMVIT offers guarantee ratios of 97% conversion and lesser degrees of acidity to optimize diesel fuel combustion. Designed with the most advanced equipment for world leading producers of palm and soybean, our biodiesel extraction plants are synonymous with efficiency and profitability. Biofuels provide a source of green, recyclable energy and reduce greenhouse gas emissions by 41% in addition to boosting rural economies and generating employment by promoting the implementation of a new sector in agricultural field. 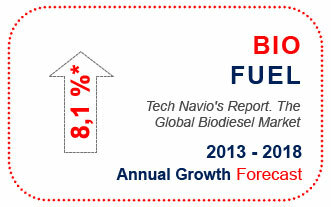 With annual growth of 8.1% expected between 2013 and 2018 (Tech Navio’s Report, The Global Biodiesel Market), biofuels notably improve the competitiveness of countries reducing import from traditional energy sources.